The Route 1 enables you to fully experience the Pantanal Matogrossense by focusing specifically on the most relevant faunistic area where you may meet the most varied species such as toucans, anacondas, caymans, and the jaguar especially. Everything in comfortable and cozy accommodations. 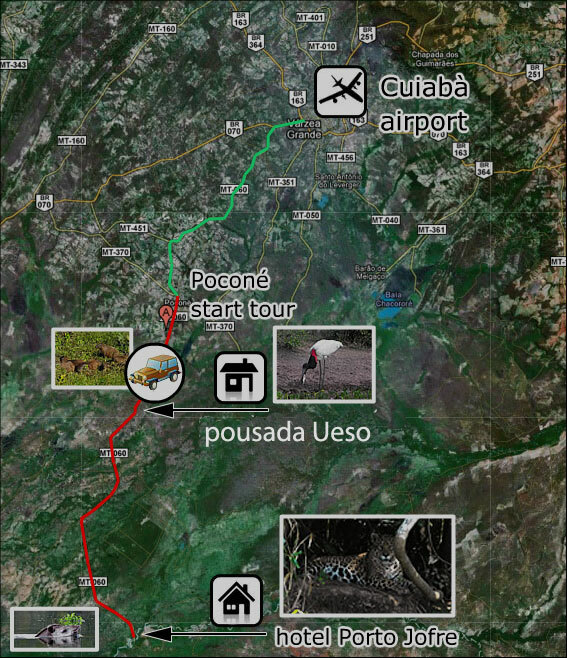 Stages: Cuiabà Airport; Start of Tour in Poconé; Accommodation Pousada “Estancia Vitoria” and Pousada Antigo Laje. Conditions: The cost of the Tour through Pantanal includes transfer to/from Cuiabà airport, all transfers mentioned, stay in pousada by full board, daily excursions with a bilingual guide. All expenses not mentioned in the routes and drinks are excluded. The tour includes trips by safari open jeeps. Departure for Poconé (The capital of Pantanal); a short tour of Poconé, lunch in churrascaria (not included) and departure to the Pousada “Estancia Vitoria”. In the evening, after dinner in Pousada, there is a short night safari during which you may bump onto various animals and nocturnal birds, including crab-eating foxes, tapirs, white-lipped peccaries, raccoons and ocelots. Departure in the morning for a walk, or a ride (optionally) inside the pousada (the entire pousada has an extension of about 3000 hectares) where you could appreciate the characteristic caymans of the Pantanal (Jacarè), the Jabirù (or Tuiuiu, the symbolic animal of the Pantanal), the capybaras (the largest rodent in the world) and innumerable bird species. You will have lunch in the pousada and, in the afternoon, departure for Porto Jofre, where the Traspantaneira ends, with some stops on the way to appreciate the various species of aras: the hyacinth macaw, the blue-and-yellow macaw (with yellow and blue plumage), nesting places of Tuiuiu, toucans, families of Capybaras, and with some luck the great anaconda and the famous jaguar (Onca pintada). You will have dinner and stay the night in the Pousada Antigo Laje. Day given to search for and contemplation of the Jaguar. Back to the hotel after sunset to have dinner and spend the night. Free morning to rest and stroll around the pousada. Lunch and, in the afternoon, visit of some artisan stores in Poconè for the purchase of typical products and souvenirs; Then return to Cuiabà airport.